On my daily walks I have noticed St. John’s Wort (Hypericum perforatum) blooming along the path and in the field. Knowing this had potential as a dye plant, I spent the evening looking up dyeing information both online and in the books I currently have. The books I have available that give recipes for red are Jenny Dean, Wild Color and Rita Buchanan, A Dyer’s Garden. The others I have only mention greens and yellows using the entire plant top. I have ordered two dyeing books through the inter-library loan (a free service through local libraries in British Columbia). A Dyer’s Manuel,by Jill Goodwin, as recommended by Dorothy here and Craft of the Dyer: Colour from Plants and Lichens by Karen Leigh Casselman. I don’t know if they list Hypericum, but they will be interesting nonetheless. 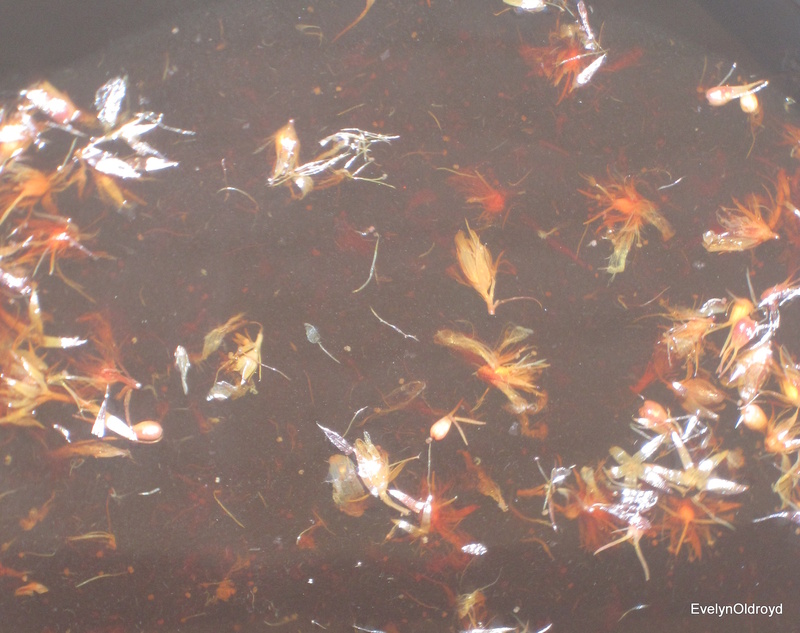 Recipes in my books say it can be used with no mordant to obtain a nice reddish-brown colour on protein fibres. The recipes describe a process using both un-mordanted and mordanted fibre. Being impatient to begin, I decided to start with mordanted silk and wool as an experiment. On my walk this I morning picked a big bunch of plants. This plant is on the B.C. Nuisance Weed list so I have no problem with picking the whole plant. I then picked off the flower heads and can use the rest of the plant for another dye bath which should give a nice rosy tan (according to the books). I did find it difficult to ascertain from the recipes what part of the flower head to use. The sources both say “the flower”, but do not say anything about whether or not the whole flower head is used which has some green parts, or just the petals. I am using the entire flower head in this sample. Picking off the flower heads sounded tedious enough, never mind just the petals. My fingers are stained a nice dark red. There is a lot more St. John’s Wort out there and up at higher elevations the flowers will just be starting to bloom so I can find more if this works. I ended up with 27 grams of flower heads. The recipes call for equal proportions of dye stuff to fibre. I began skeining some silk and at 5 grams decided I had enough. 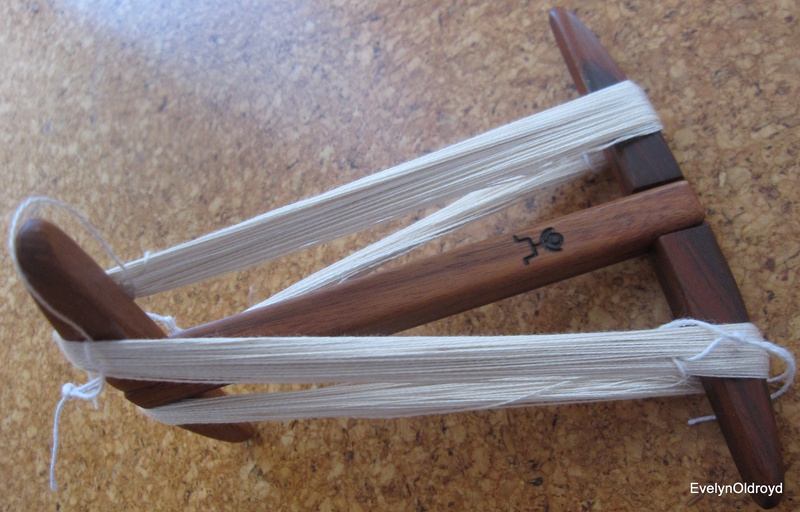 (30/2 silk takes awhile to wind even 5 gms.) This is my mini niddy-noddy which makes a great sample skein with a total length of only 22″. I cannot remember the name of the company, but that is their logo burned into the wood. I also made a 10 gram skein of merino wool. From my indigo dyeing experiments I knew the water here is a little acid, so re-tested and added soda ash to bring the ph level to about 9 and added my flowers. They are simmering in a crock pot and the dye bath looks quite red. I think the steam clouded the camera lense in this photo. At this point I realized I have added too much liquid for the amount of flowers which will probably have some effect on the results. The water here is also hard, though we do have a water softener which I hope counteracts the mineral concentrations for dyeing purposes. In the following photo I am adding a skein of wool and can see the red-orange of the dye bath. After simmering for an hour I left the flowers in the dye bath (didn’t think it mattered much for the samples) and added the skein of silk. I kept it just below simmering for an hour. I would say the colour take up happened in the first half hour – nothing seemed to happen after that. After an hour I added the skein of wool and left the silk in. The dye bath was very red still but the silk wasn’t getting darker. 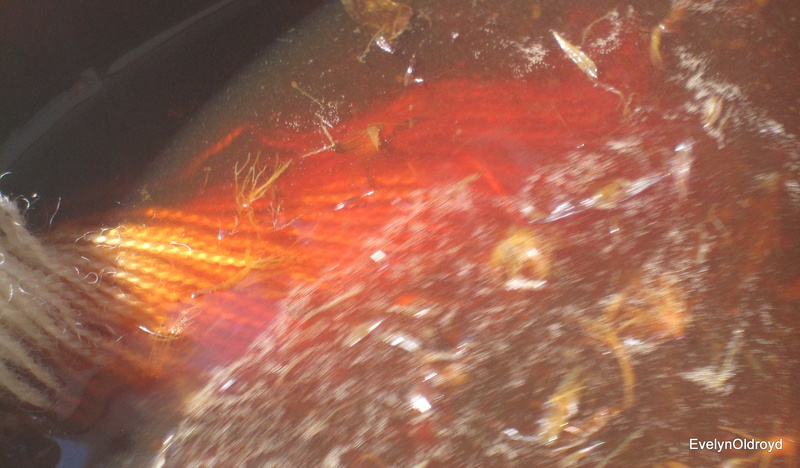 The two recipes, one which makes reference to A Colour Cauldron by Sue Grierson, describe a process for getting four colours from the one dye bath. First they use an alum mordanted skein, then an un-mordanted skein, third another alum mordanted skein and fourth an un-mordanted skein. The first colour is green, second red, third red-brown, fourth yellow. A question I have about the 4 skein recipe is the effect of putting a first skein (alum mordanted) on the second skein (un-mordanted). Could some of the alum might dissolve into the dye bath or does the first skein take up the green pigments in the bath and leave the red? For the sake of experiment when I removed the skeins after another hour at just below simmer I added a tiny bit of alum to the bath and another skein of wool. 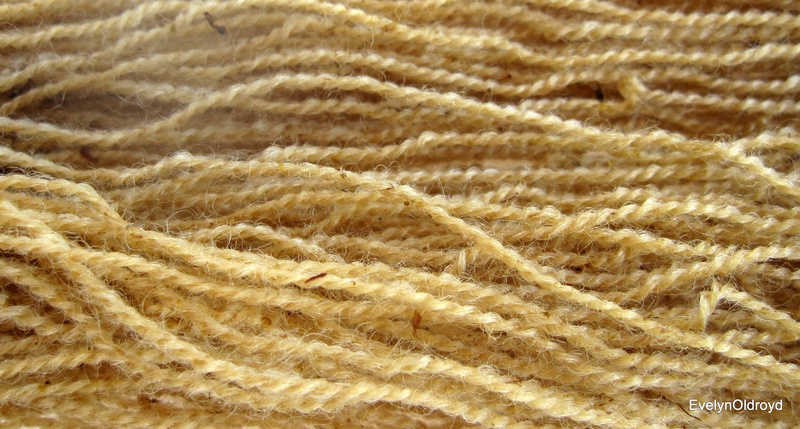 This skein is turning a golden colour. After another hour I turned off the pot and left this last one in the bath until cool. The first two skeins right out of the dye bath, lots of reddish colour (and flower bits). After rinsing the skeins there was some reddish-purple colour in the silk though lots of colour washed out. 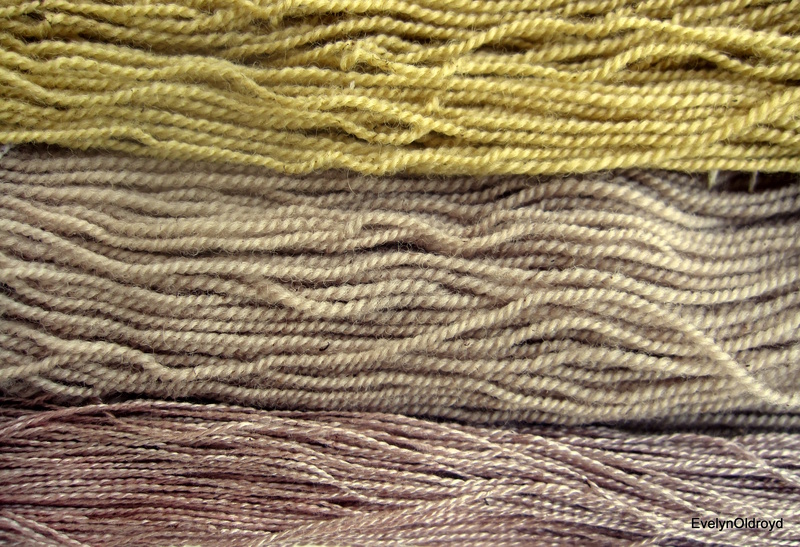 After drying both silk and wool were silver-grey . ( forgot to photo that) I rinsed the skeins again with a small amount of vinegar and the colour came back on the silk, the wool stayed the same. Strange! This made me wonder if in fact an acidic dye-bath would work better. The third skein after rinsing in a slightly acidic bath. The colour in this photo isn’t at all right. It is a more a mustard yellow and darker, but I cannot get it to adjust. All three skeins dry. Bottom, silk which was first into the dye pot, middle, wool added after the silk had simmered an hour and top with alum added. The colour in the silk shows well in contrast to the wool, but on its own one it looks silvery grey with a hint of mauve. Now that I have tried this and can see the beautiful red colour in the dye bath and that there can be colour on the silk especially, I will try again. The next time I will prepare with some pre-mordanted skeins of wool and silk and do the 4-step recipe. The books do not say anything about colour fastness, so I will use a portion of each sample and do a test. Beautiful soft colors actually. It will be interesting to see if you get the reds next time around. We had a ton of St. Johns Wort after building here, disturbed site…anyway, most of it has died off leaving room for the grasses and more delicate wildflowers. Amazing how the alum changed the color there! 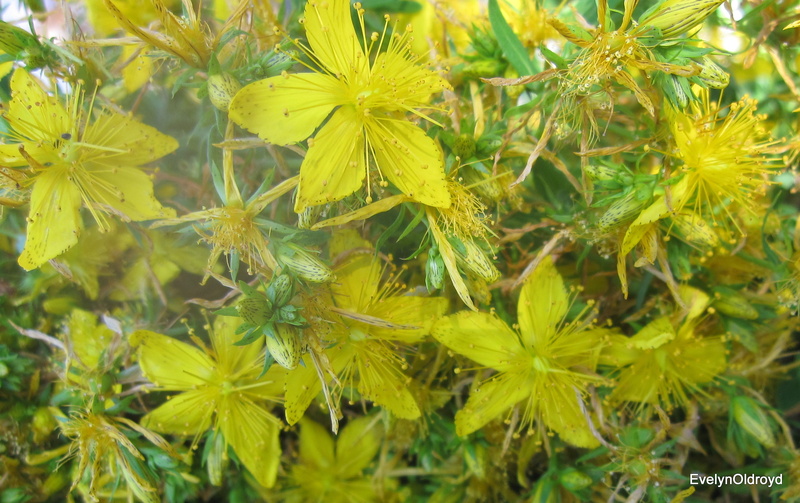 I love all the colors you got from St. John’s Wort. The niddy noddy is from Little Man Howell. I also was going to say that the niddy-noddy was from Howell’s. I have a couple of tools with the Little Man on them. Interesting colours from the Hypericum. I have a small patch of these but not enough for even a small experiment. It’s pretty fun to think you can get three colors form one dye bath. I’ve only used alum but have purchases iron and copper and hope to get the inspiration to tackle some natural dyeing soon. In answer to your question, I have no idea how many miles I spun during the World Cup. I think that’s the Tour de Fleece people doing miles. I love your site ,It is a pleasure to visit. Please link site to your site. What’s up to all, the contents existing at this website are in fact amazing for people experience, well, keep up the nice work fellows. my friends, for the reason that if like to read it afterward my contacts will too. What’s up friends, its fantastic article on the topic of educationand entirely defined, keep it up all the time. Thank you for all of your work on this! I found a patch of these flowers in the yard and can’t wait to try it out for all four dips! Really enjoyed reading your blog. Cascade Cottage, Christina Lake, B.C.